Bragging rights in pitlane go on the line tonight, with the grand final of the PIRTEK Pit Stop Challenge. The grand final will be broadcast live on Fox Sports’ dedicated Bathurst channel from 6:30pm AEDT, with two semi-finals ahead of the main event. Teams will push cars into position and change all four tyres, before pushing them across a finish line. The winning team will be awarded $25,000 plus the perpetual PIRTEK Golden Rattle Gun Trophy. The competition ran across six Supercars events including all five SuperSprints and the CrownBet Darwin Triple Crown. Times were recorded from pitstops and the fastest teams at each event received a score of 26, while the slowest team received a score of one point. Now there are just four teams remaining; Tim Slade’s Freightliner Racing Team, both Scott McLaughlin and Fabian Coulthard’s Shell V-Power Racing Team Falcons and the Nissan Motorsport Altima driven by Michael Caruso. Freightliner Racing has been the fastest team in pit lane in 2017. The team worked overnight to repair the Commoodre following a massive crash in practice at the Supercheap Auto Bathurst 1000 yesterday. Fabian Coulthard’s Shell V-Power Racing Team’s #12 team vs Michael Caruso’s Nissan Motorsport #23 team. 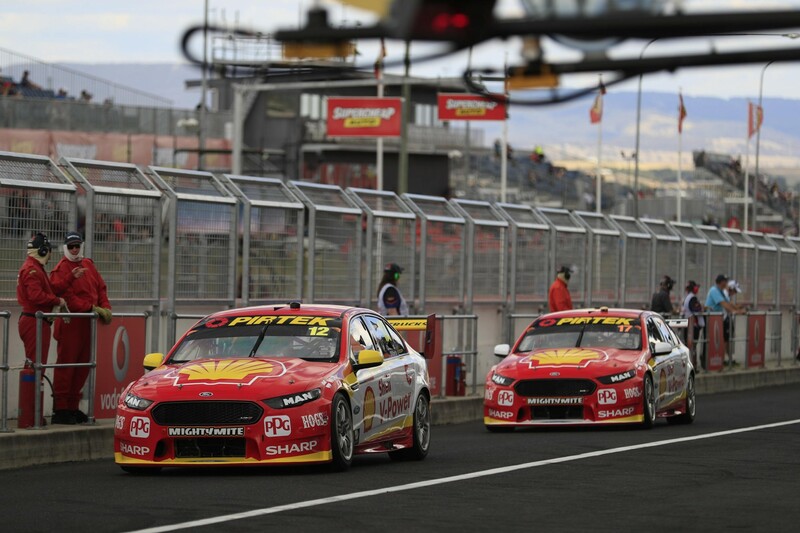 If the two Shell V-Power Racing Team Ford Falcons win both semi-finals, it will be time-trial grand final. Quickest time from start to finish will be crowned the champions.